Everything except the So Saffron card base is a leftover! The pieces were all sitting around on my stamp table; a few things from December's Paper Pumpkin kit, a couple stamped images from my Technique Time! stamp class, and remnants from my pack of Perfectly Artistic DSP. but a vintage television set? 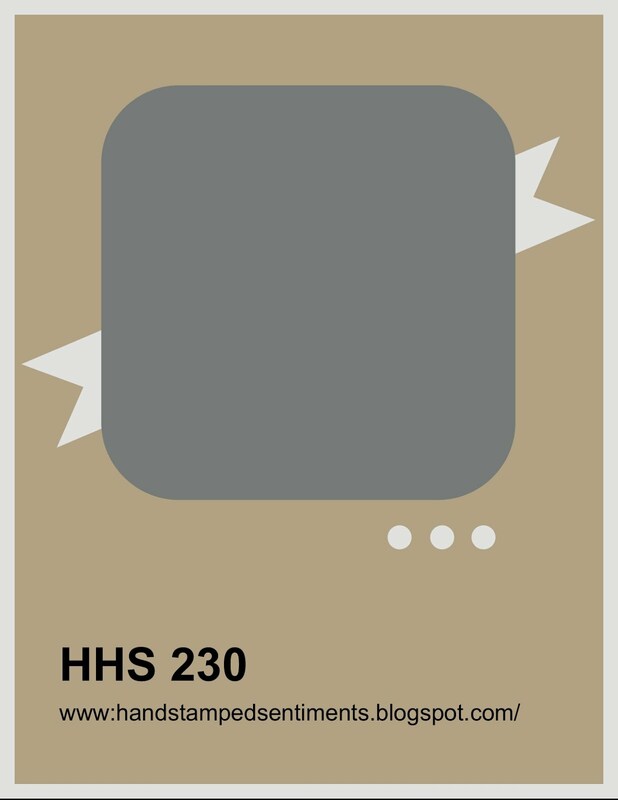 Well, my card looks nothing like a tv. 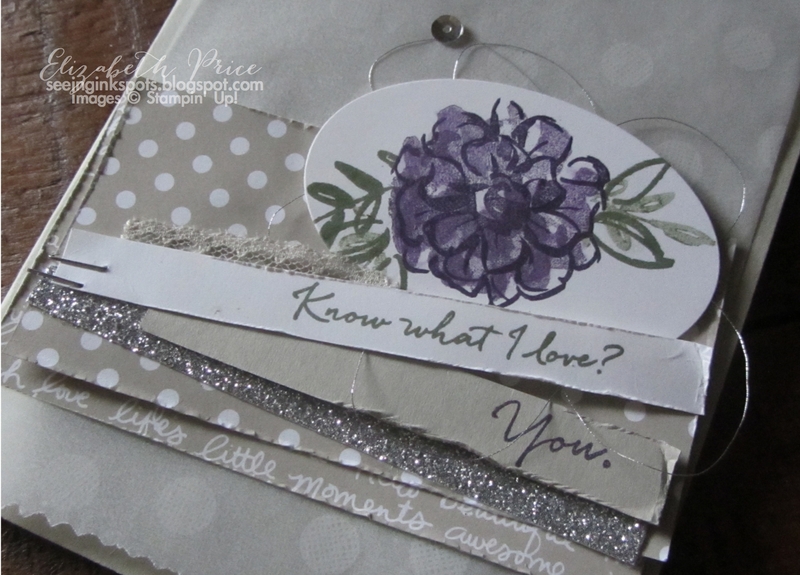 Instead it is a simple fresh take on the sketch, it's free of paper or card stock layers. I used a spring toned watercolor background to base my flowers for the main square panel of the sketch. I also took some liberties with the diagonal banner by wrapping Gold Metallic Thread around and around. 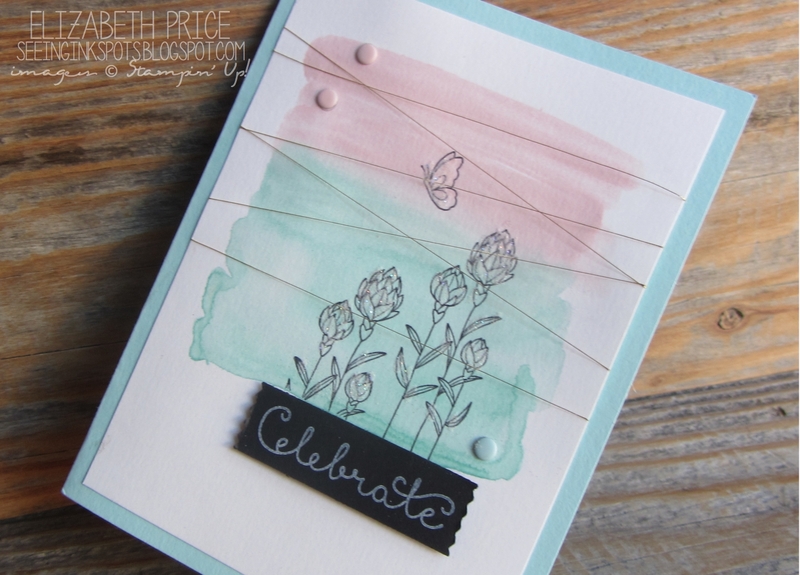 I wanted this element of the challenge to be as visually light as the watercolored layer. 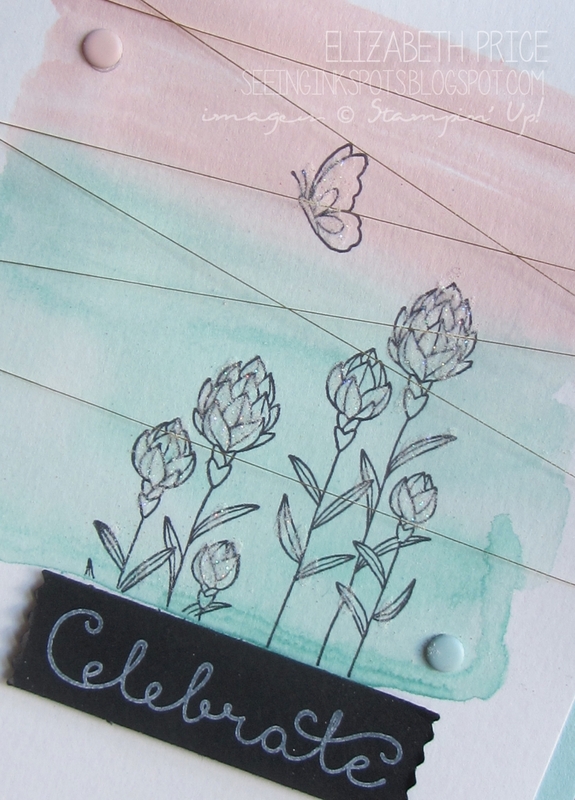 The Flowering Fields images are stamped with Archival Basic Black Ink and accented with Dazzling Diamonds Glitter. A trio of Subtle Candy Dots in just the right place adds a certain something that I really like. I put them on and literally nodded my head and thought "oh yeah that's a perfect finishing touch--I'm so awesome!" Head on over to Hand Stamped Sentiments to see what the rest of the Design Team have created using this new sketch challenge. (I doubt they saw what I saw). 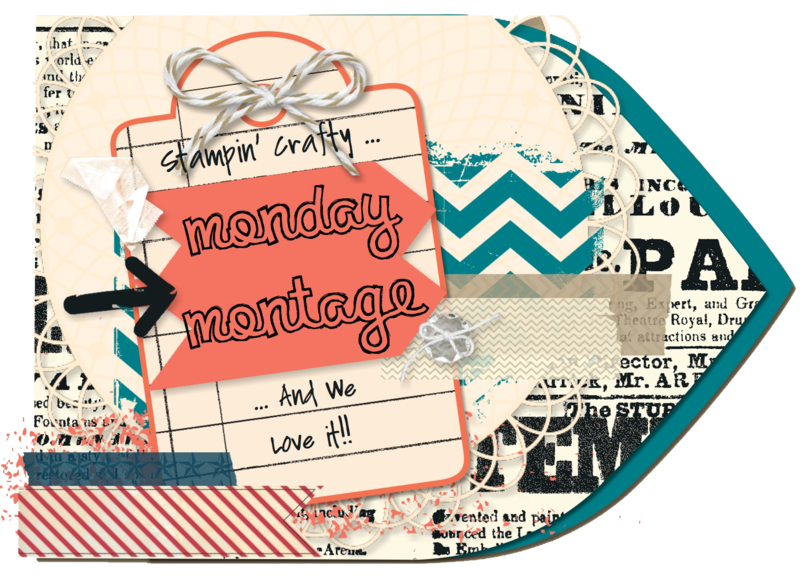 my blog about everything inkin', stampin', and creatin'. 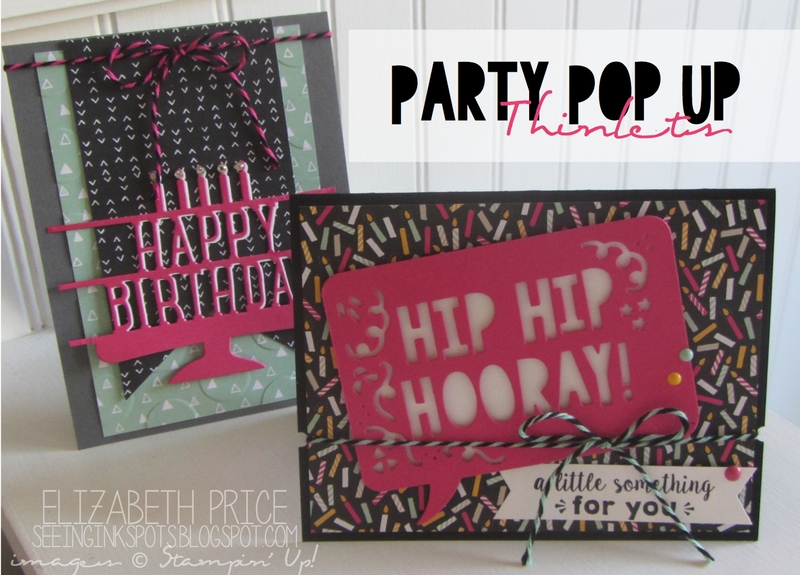 The Party Pop Up Thinlets are SO AWESOME! 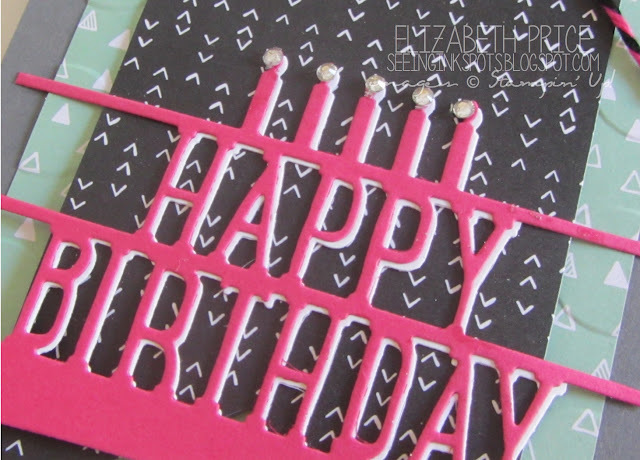 on the layer below--pretty cool, easy, and full of sass! Cut two of the cake and off set them for a drop shadow. I love the smallest of the Basic Rhinestones as the candle flames. 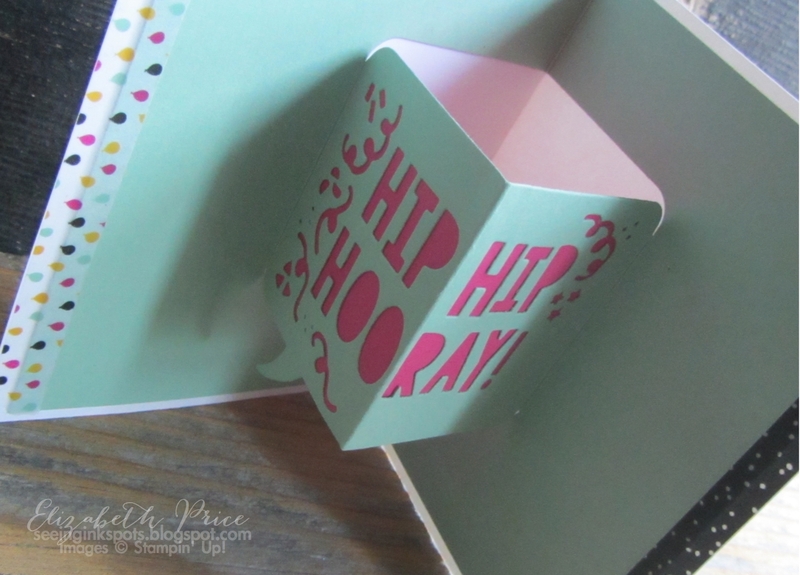 I seriously am incredibly obsessed with the Party Pop Up Thinlets. With this obsession I guess it's okay to keep trying new ideas because there is never a shortage of birthdays. 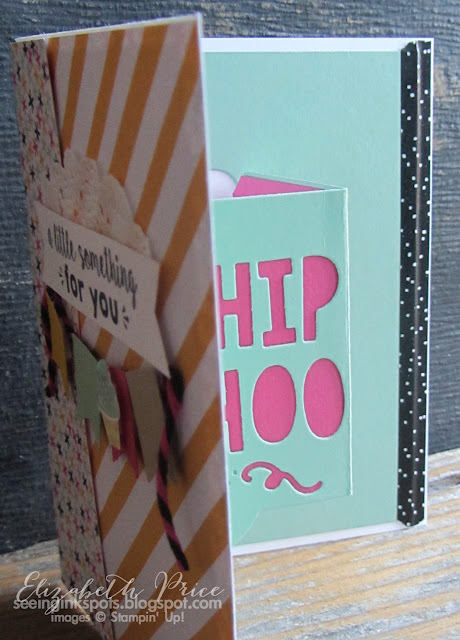 Since I have had the It's My Party Suite out and on my stamp table I have been clipping and cutting and punching and glittering lots of birthday cards. Some really cute and fun and some not so great--they can't all be winners if you know what I mean. 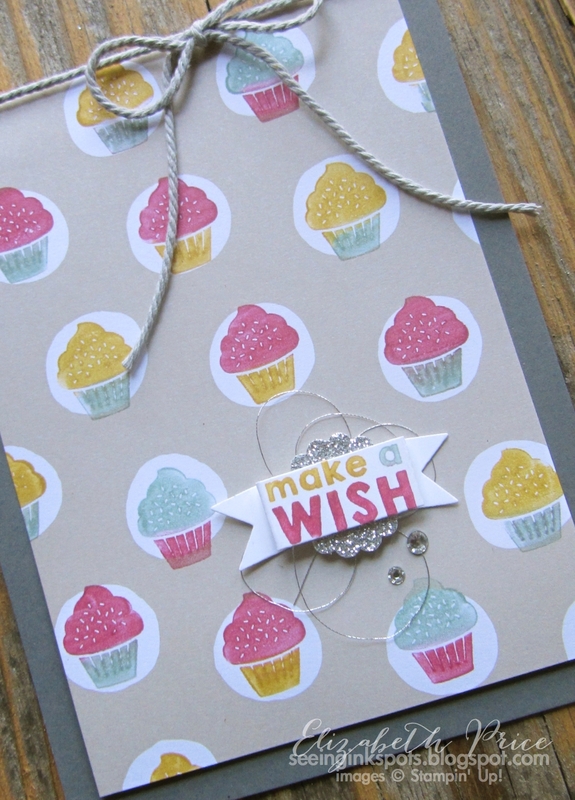 I am also addicted to the Thick Whisper White card stock. 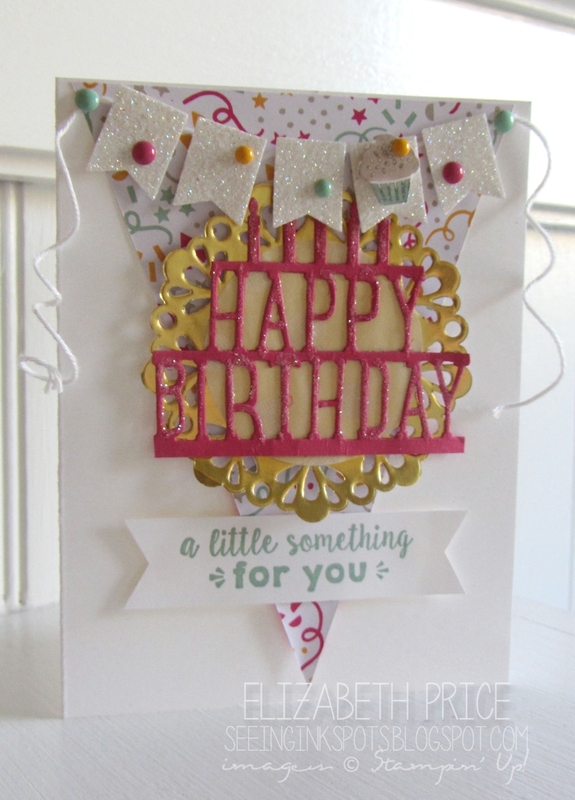 It's the perfect answer to wanting a crisp and clean bright card base. I go through tons of the stuff. 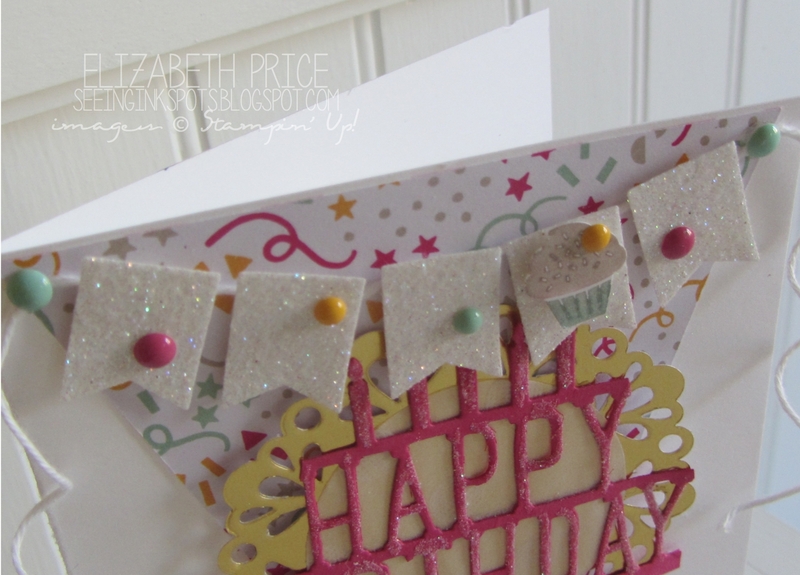 I also seem to be blazing through my It's My Party Enamel Dots. How about you? What is your stamp or accessory obsession? 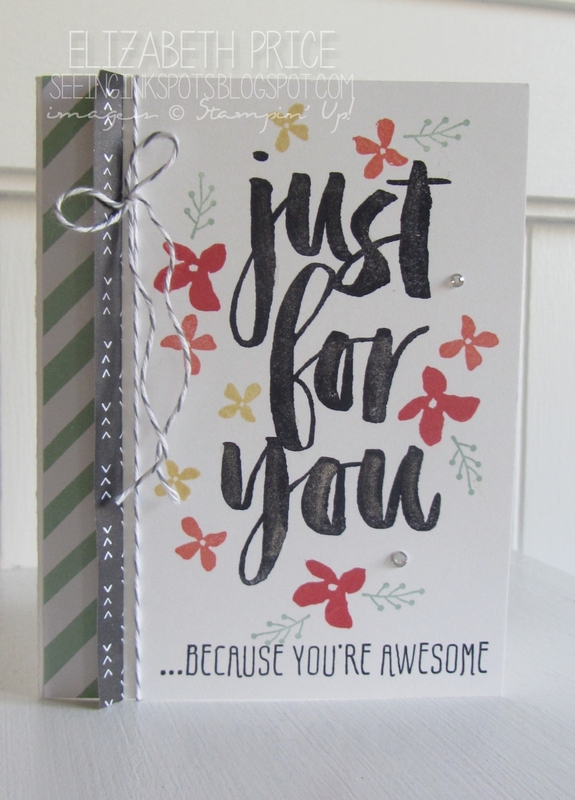 My absolute most very favorite stamp set offered in the Sale-a-Bration catalog is the 'Botanicals for You' collection. It could even be one of my most all-time favorite sets! The big main image is the epitome of total awesomeness! I was inspired by a sample in the SAB brochure for this card. 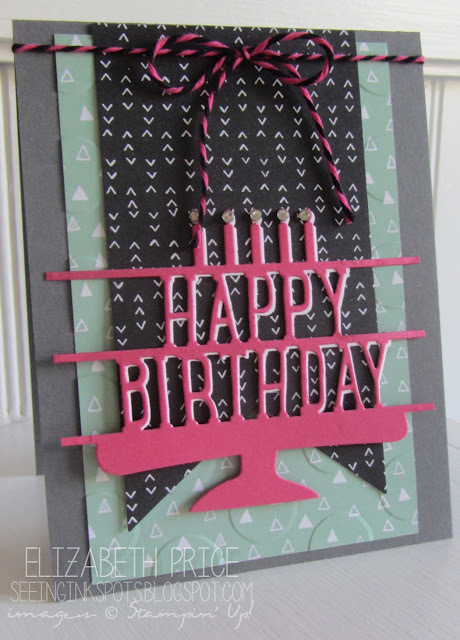 To put my own spin on things I added a strip of It's My Party DSP to the left side and a bakers twine shoe string bow. Take a close look and the greeting and you'll see additions of Wink of Stella in the clear color. I love lots of people, places, things, and fabulous foods, but most of all I love my FAMILY! For our color challenge at Hand Stamped Sentiments I decided to open up, for the very first time, my What I Love stamp set. It's a Sale-a-Bration freebie and it's beautiful. 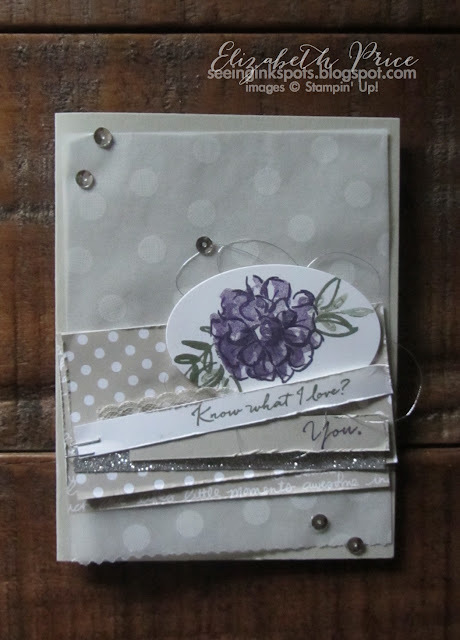 For the flower, from the What I Love set, I stamped with Elegant Eggplant for three levels of color by "stamping off" once and then twice for the three steps of stampin' images. You can't see it, but the flower has been embellished with some Wink of Stella in the clear color. That stuff is so yummy and makes everything glisten and sparkle and shine--it's glorious! The patterned papers come from the Neutrals DSP Stack and did you notice the polka dot glassine paper? 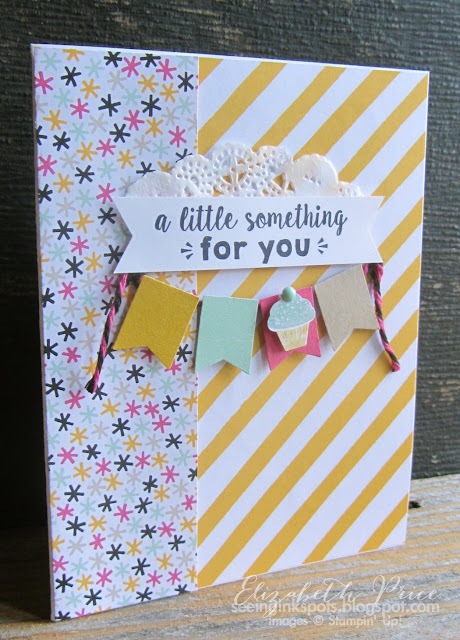 That is actually cut from the Sketched Dots Tag a Bag Gift Bags. 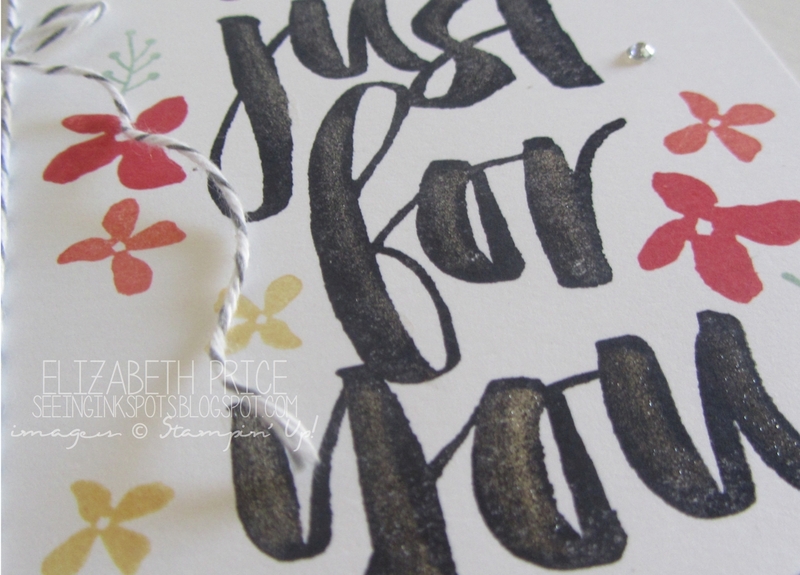 A few extra details that I always love including are some Silver Metallic Thread, Silver Glimmer Paper, Silver Sequins (leftovers from a Paper Pumpkin kit), a tiny piece of Sahara Sand Lace Ribbon, and two staples. Hello bloggin' friends and welcome to another friendly and fun Monday Montage hop. 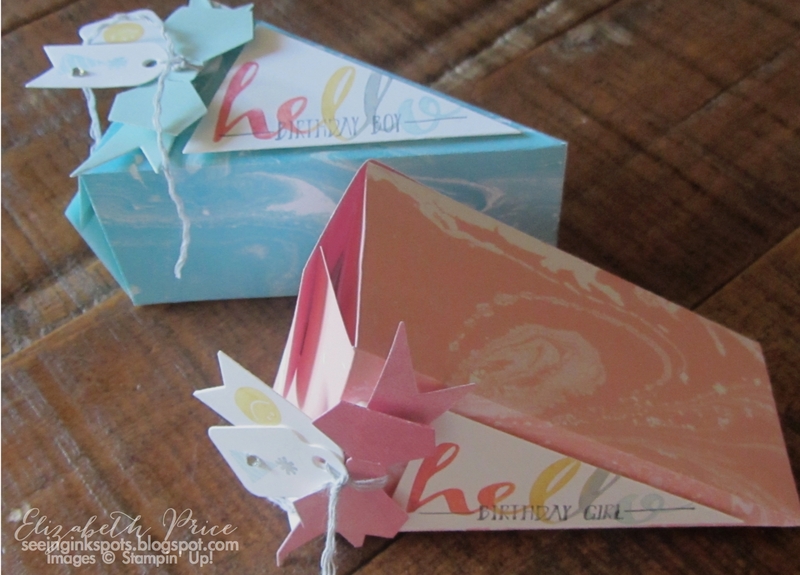 I am giving you a look into one of the projects we made at my Technique Time! stamp class this month. Each class member could chose their color of DSP from the Perfectly Artistic to make a Cutie Pie box. 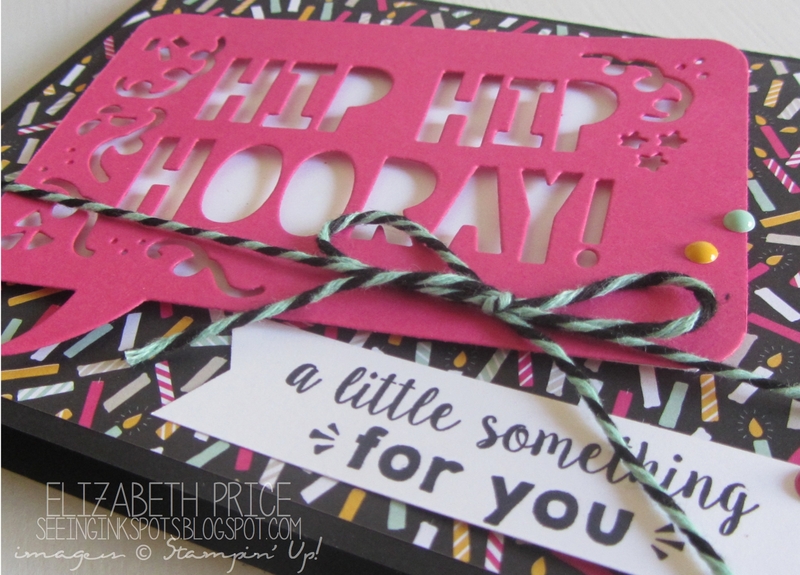 If you have not seen the limited time DSP and Hello stamp set from the Sale-a-bration brochure, go see it real fast. 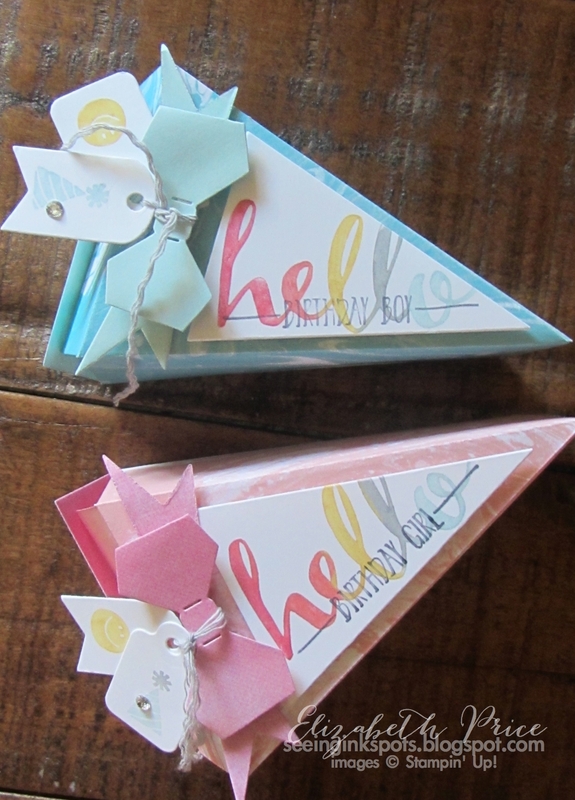 The stamps are charming and the paper is AWESOME. 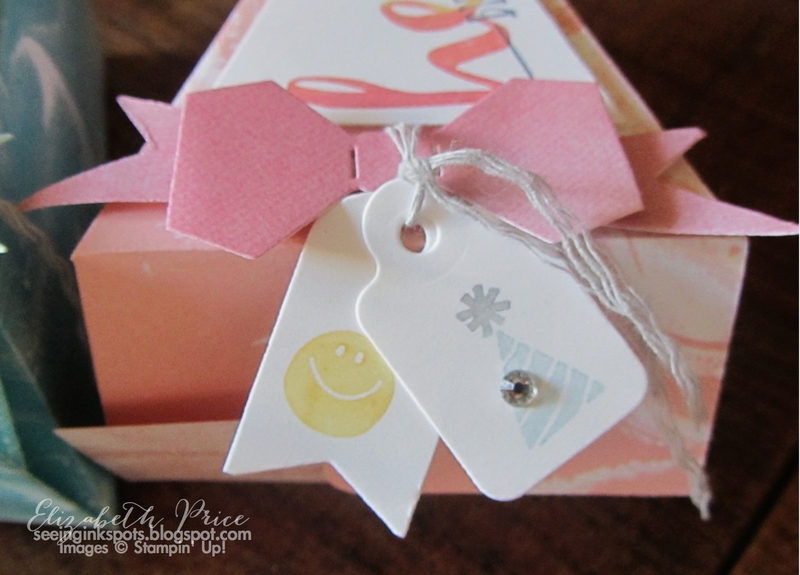 The tags, which come in the Cutie Pie Thinlets, are tied to the bow with Smokey Slate Thick Twine. I just unwound the threads to be able to pull out and separate a few strands of twine for a softer look. 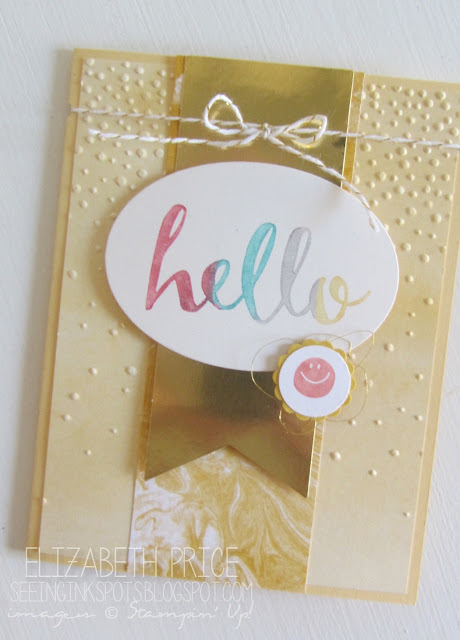 Happy 2016 and a big welcome to our January Creation Station Blog Hop. 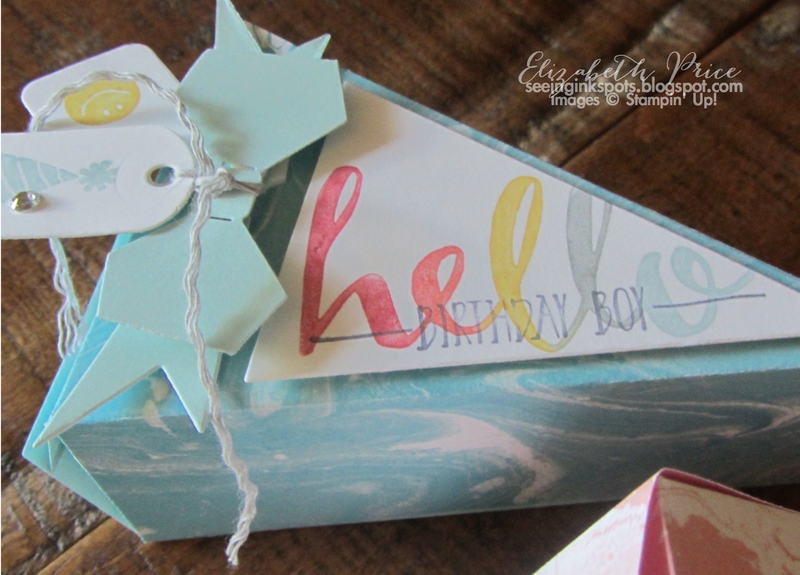 For this month's hop the theme is our new favorite item(s) from the Occasions Catalog. Wow, that's a bit tricky to choose a favorite, but I do really REALLY love all the new products in the It's My Party Suite. The Party Pop Up Thinlets were what first caught my eye from the It's My Party Suite. So, I bought them and just about everything else from the collection. Once I started creating with my new stamp toys I found I have a second favorite and that is the Party Wishes stamp set, specifically the cupcake image, and the coordinating cupcake punch from the Party Punch Pack. 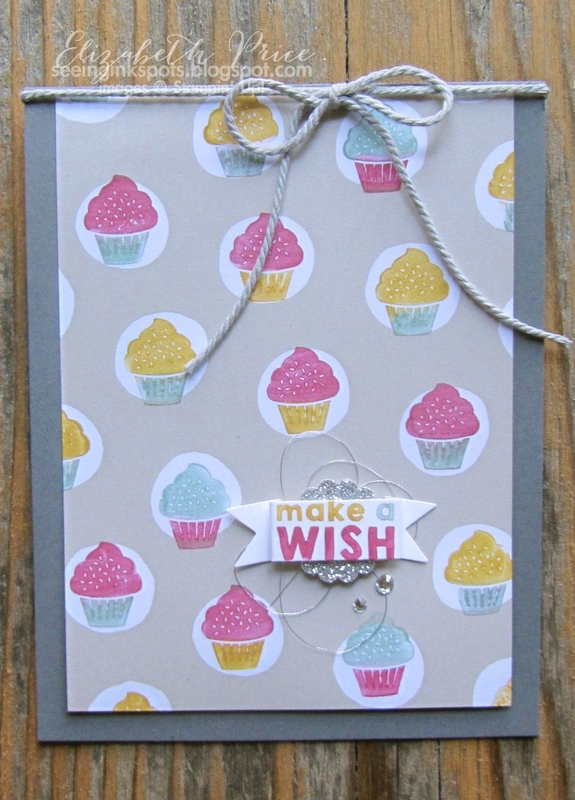 I mentioned I love the cupcake image and put it to fun use on this second card. This card is SUPER cute CA-YOOT in person! 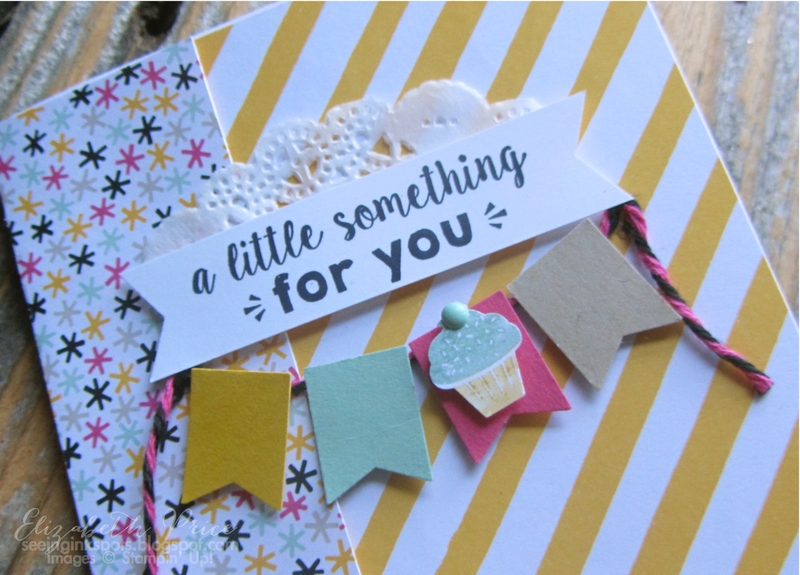 It's so simple, but so adorable and it's the piece of paper from the It's My Party Designer Series Stack. 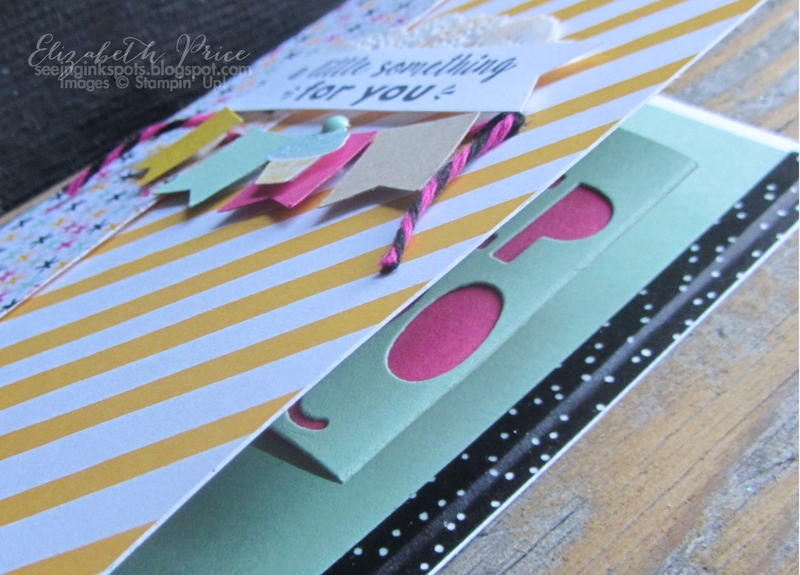 That's another favorite as it's tons of great DSP for a fabulous price. Do be sure to check out the entire hop as we have some fun posts to share. 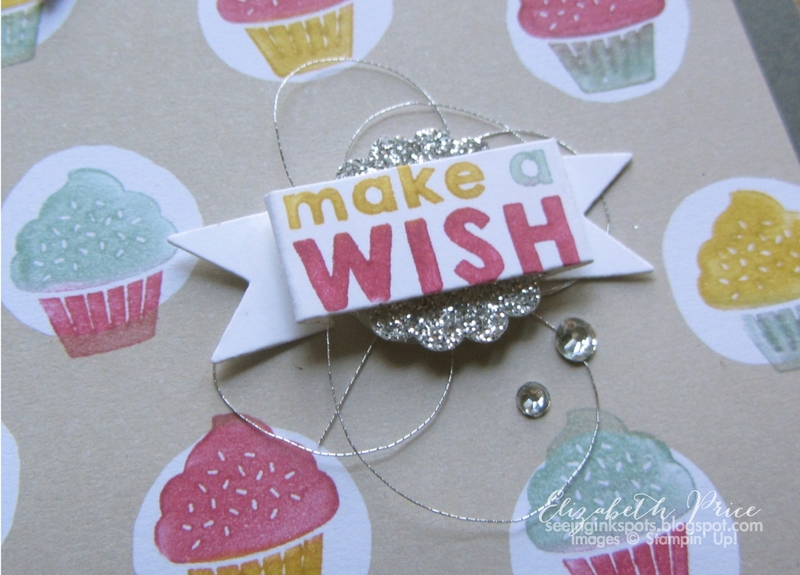 Click back to see Denita's blog or next for Nicole. Enjoy and happy stampin'.